This weekend the Tea Party Express team is at the Conservative Political Action Convention (CPAC) alongside conservative leaders like Sarah Palin, Paul Ryan, Gov. Scott Walker, Congresswoman Michele Bachmann and many others! Our purpose here is simple: raise awareness of our campaign to take control of the Senate by electing real conservative leaders. We are doing something special to promote this campaign! 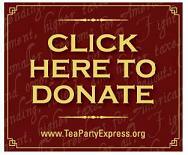 You can help our campaign and enter a raffle to win an all expense-paid trip to spend two days aboard the Tea Party Express bus during our next bus tour! We will pay airfare, hotels, and meals, and will give you and all-access pass, and the opportunity to join us as we fight to take back the Senate and make history. Every $25 donation earns you 1 entry into the raffle. If you donate $100, you will be submitted 3 times into the raffle. The Tea Party Express came into existence as the tea party movement was awakened by the famous Rick Santelli rant that swept across the country in February of 2009. This power and influence could not be ignored by the political establishment as the grassroots movement exploded onto the scene. Now, after nine national bus tours and several regional tours that hosted over 500 rallies, the Tea Party Express has become nationally recognized for making a difference in critical elections. © 2011 Tea Party Express. Contributions are not deductible for income tax purposes. Corporate and foreign funds are not permissible.